I wrote about my first experience in Eric Whitacre's Virtual Choir on my other blog, Musings at Musespeak. The Calgary Jazz Orchestra performed a selection of popular love songs made famous by Billie Holiday and Chet Baker on Sunday, February 12, 2012 at River Park Church. Calgary vocalists Johanna Sillanpaa and Johnny Summers heated up the stage with their sultry vocals. The E.P. Scarlett Big Band kicked things off with “Happy Go Lucky Local” (Duke Ellington), an medium swing number. This was followed by a funky number called “There's the Rub” (Gordon Goodwin). The E.P. Scarlett Big Band of Calgary is directed by Jonathan Bell. During his patter, director Johnny Summers, explained the inspiration for the change. Last month, the CJO had the opportunity to work with Grammy winning musician Maria Schneider. These arrangements are the first to bear the fruits of their time with Schneider. “We're just scratching the surface,” said Summers. “Stay tuned. It's gonna get crazy up here!”The CJO with two arrangements for small jazz combos. The group welcomed guest artist Johanna Sillanpaa of Calgary to the stage to bring some of Billie Holiday's memorable love songs to life. “My Man” (M. Yvain) featured Gerry Hebert on clarinet, Al Muirhead on trumpet, Sarah Matheson on bari sax and Willy Joosen on the piano. “Crazy He Calls Me” (C. Sigman), a sultry love ballad, featured Jeremy Brown on sax, Johnny Summers on trumpet, Willy Joosen on piano, Kodi Hutchinson on bass and Greg Baker on drums. The other members of the Calgary Jazz Orchestra came on-stage for the remainder of the first set. From the opening bar of F. Andre's “Dream a Little Dream of Me”, it was apparent that something was different. The group got in to the music a little more, while the solos by Al Muirhead and Jeremy Brown were melodious and featured new licks. This number gave Sillanpaa a chance to showcase her rich, warm low register. The Brahms' “Lullaby” quote at the end was a nice touch. “He's Funny that Way” by R. Whitting and “What a Little Moonlight Can Do” by H. Wood rounded out the first half. Whether singing in a small combo or with the entire jazz band, Johanna Sillanpaa's strong and sultry voice projected clearly, seemingly without effort. The second half of “An Evening of Romance” also featured small combo arrangements before moving on to big band music. “You Go to My Head” by F. Coots, a soulful love ballad, featured Shane Statz on tenor sax, Kodi Hutchinson on bass and the vocals of Johnny Summers. Children's entertainer Raffi surprised the audience when he stepped up from the audience to sing “A Wonderful World”. Chuckles and cheers resounded when he sang “I see friends shaking hands, saying, 'Yo what's up?” Raffi did a quick plug for a cause close to his heart, the Centre for Child Honouring. A nice trumpet solo opened “Let's Get Lost” (J. McHugh) before switching off to saxophone. This medium swing number featured soulful solos by Al Muirhead, Shane Statz and Willy Joosen, along with the vocal styling Johnny Summers. The programme drew to a close with the sexiest version of “My Funny Valentine” that I have ever heard. The very sultry introduction featured Willy Joosen on piano and Al Muirhead on flugelhorn and Greg Baker using softer mallets on percussion. One could imagine smoke wafting through a jazz club on a hot summer's night during Al Muirhead's solo. Three more numbers rounded out the second half: “You'd Be So Nice” (Cole Porter), “The More I See You” (H. Warren) and “Isn't It Romantic” (R. Rodgers). The Calgary Jazz Orchestra is a 17 piece big band founded by Johnny Summers in 2004. Arrangements for “An Evening of Romance” were written by Johnny Summers and Greg Baker. The fresh arrangements and easygoing demeanour of the Calgary Jazz Orchestra members at “An Evening of Romance” left me with two impressions: 1 – I must buy some music by Maria Schneider and 2 – I can't wait to hear what the CJO is going to do next. In September, the CJO presented a concert featuring swing, Latin and Cuban music. In December, the big band performed Christmas hits made famous by Frank Sinatra. Jazz lovers will have two more opportunities to hear the Calgary Jazz Orchestra in the 2011/12 season. 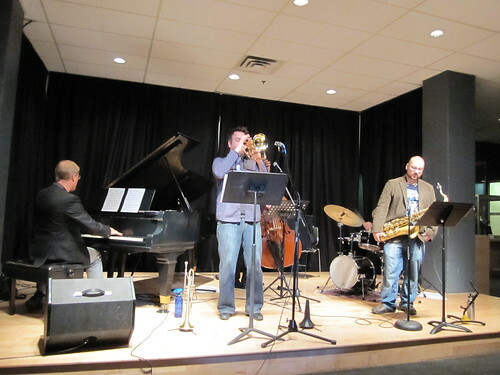 On February 25, 2012, the CJO will perform at 18 Degrees of Jazz. Proceeds from this fundraiser go to benefit the Big Brothers Big Sisters of Calgary and Area. Blues tunes and numbers written by CJO members will be featured at the May 6, 2012 concert. You can buy concert tickets on the Calgary Jazz Orchestra website. (c) Rhona-Mae Arca, Musespeak(TM), Calgary, AB. All rights reserved. Originally written for Suite101.com in November 2010. Another one that didn't survive "The Big Purge"
Do you suffer from back pain or poor posture? Sway, wiggle and squirm your way to correct posture and pain relief with the FitBall Wedge. On December 11, 2009, Fox News reported that a study conducted by the Institute for Medicine and Public Health found that people spend an average of 56 hours a week sitting. In "That's the Way the Ball Bounces!" from Working Well, it states that the average American spends 14 hours a day sitting. Even more alarming is the conclusion Genevieve Healy, Ph.D. from at the Cancer Prevention Research Centre after a conducting a study at the University of Queensland in Australia. She reports that not even 30 minutes a day at the gym can counteract the effects of sitting for eight, nine, or 10 hours a day. Active sitting can relieve pain and fosters overall health. It is also known as "unsupported seating" and "sitting in motion." Active sitting encourages the body to move and adjust constantly. It also encourages the body to sit in a more natural position. improved core fitness: Continuous movement to re-stabilize your torso strengthens your spinal and abdominal muscles. burn calories: You can burn up to 350 calories a day from active sitting. improved balance: Active sitting is a form of balance training. fosters natural body posture and alignment. What is the FitBall Wedge? The FitBall Wedge is an active dynamic seating device. It is an 13" inflatable wedge made of PVC. One side is smooth while the other has sensory bumps. There is also a 10" FitBall Wedge Junior for children. The FitBall Wedge can be placed on the seat of any office chair or task chair. While sitting with the FitBall Wedge, make sure that both feet are firmly on the floor. Bounce in your seat, move back and forth and from side to side to enjoy the benefits of active sitting. Alternatively, you can place the FitBall Wedge on the back of a chair for extra lumbar support. You can use an air mattress pump or air raft pump to inflate the FitBall Wedge. Beginners should start with more air in their FitBall Wedge until they have adjusted to active sitting. Simply wipe down the FitBall Wedge with soap and water to clean it. I purchased the FitBall Wedge one week ago to encourage my piano students to sit properly at the piano and to ease my own back pain. My students, aged five to 50+, giggled over the new cushion and its bumps. "This is fun!" was a sentiment shared by most of my students just minutes into a lesson. My three fidgety students appeared more focused during their lessons. It helped that I placed another active seating disc at their feet. Each student who used the FitBall Wedge looked more relaxed at the piano bench and sat with proper posture. I have often noticed classically-trained pianists play with stiff posture and limited range of motion. My students were forced to move with the wedge, making their playing more natural looking, ergonomic and expressive. I found the FitBall Wedge a back-saver. Between teaching and preparing for eight performances this month, I am at the piano over 30 hours a week and then sitting in front of a computer for at least an additional 10 hours a week. My back pain disappeared within minutes of sitting on the FitBall Wedge. There are two minor drawbacks. The FitBall Wedge is available in only one colour. I also wish it could fit more easily into a bag full of music books. However, it still is more portable than a core stability ball. As with any active sitting device, people with poor balance or who recently had back surgery should consult with a medical professional first prior to using the FitBall Wedge. If used improperly or with incorrect posture, the postive effects of active sitting can be nullified. The FitBall Wedge is manufactured by Ball Dynamics International LLC. It was founded Joanne Posner-Mayer, P.T., an expert on therapeutic Swiss Ball applications. For more information, read "Sitting Too Much?" by Selene Yager, Women's Health Magazine, Exercise Ball Moves to the Office and Understanding Musician Injuries.